NOTE: See update on this story HERE. 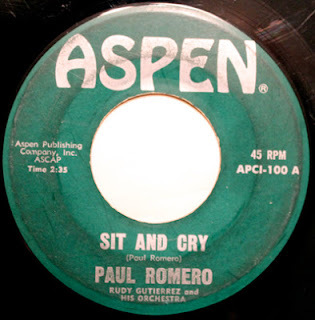 I've had Paul Romero's record "Sit and Cry" for years, and had tried in vain to find any information I could about this Pueblo single. Then three years ago, I located Paul. He was living in Texas with his wife, who had moved him into their daughter's home, so he could be cared for. She wouldn't elaborate on his condition. Every few months I would call her back to check on him, and see if I might be able to ask him a few questions about his singing career, and his time in Pueblo. She always told me, "Not today, maybe later." Sensing a reluctance to share his life with me, or his wife's fear that the conversation would tire him, I respected their wishes, and finally gave up. That said, this single is too important not to share - with, or without the history behind it. Released in 1962, the soulful "Sit And Cry" features the Rudy Gutierrez Orchestra. While the single garnered airplay on Pueblo's KDZA radio, it did not receive much notice beyond Colorado. A 1962 Billboard column said it had "limited sales potential," and that was that. No idea what happened to Paul over the next several years, but he would resurface on the Rudy Guiterrez Orchestra single, "Coqueta" (audio sample in Rudy Gutierrez Orchestra story). The rest remains a mystery.